Carbohydrates (CHO) and fat are the main sources of fuel oxidized in muscles during exercise . In contrast to fat, endogenous stores of CHO are limited. The storage form of carbohydrate, glycogen, is found almost exclusively in muscle and liver and represents only ~ 8000 kJ (about 1911 kcal) in untrained individuals and about 20–50% higher in trained men and women. However, there is a vast quantity of fat stored even in the leanest of athletes (approximately 600,000 kJ) . Physical performance (mainly endurance) and exercise ability can be limited when endogenous CHO are the dominant fuel . A high CHO diet has been traditionally promoted for athletes in order to maximize muscle and liver glycogen stores, as well as the ability to maintain their effective utilization, which often determines the final effectiveness of physical exercise . However, over the last two decades, reports suggesting benefits from purposely and strategically reducing the availability of CHO during some or all of an athlete’s training sessions (e.g., low CHO high fat diet, high/low CHO periodization, fed/fasted training) has appeared with increased frequency in the literature [5–8]. These dietary regimes are supposed to optimize fuel mobilization and utilization during exercise by activating fatty acids as an energy source during exercise. The ketogenic diet (KD) is a special example of a low CHO high fat diet. The original KD was designed with a 4:1 lipid:non-lipid ratio with ~ 75–80% of the daily energy intake from fat, 15% from protein (PRO), and less than 5% and/or 20–50 g CHO per day [3, 9–11]. After several days of drastically reduced CHO intake while maintaining the usual energy intake, glucose reserves become depleted and are no longer sufficient for either normal fat oxidation (via oxaloacetate in the Krebs cycle) or to supply energy to the brain and central nervous system . It is worth mentioning that the first studies on KD focused mainly on its efficacy in treating epilepsy and came from the early 1930s . Its possible efficacy was further investigated with regard to weight loss , insulin resistance, diabetes or high blood pressure . The KD can be characterized by pleiotropic activity. The significant influence of the KD may be related to its impact on the adaptation of the body through the regulation of the molecular mechanisms of cellular signaling [11, 15–17]. Activation of these signaling pathways may lead to a significant increase in the physical and exercise capacity, by stimulating, e.g., mitochondrial biogenesis, capillarization, regeneration processes, and especially, effective fat energy substrate utilization [18–20]. The relationship between KD and inflammation/oxidative stress may also be significant, which has been observed in the therapy of metabolic, neurodegenerative, and other disorders related to the severity of inflammation (e.g., diabetes and obesity, polycystic ovary syndrome, autism, acne, asthma, multiple sclerosis, Alzheimer’s and Parkinson’s diseases) [11, 15, 16, 21–30]. Beneficial effects may also involve the strengthening of brain function and cognitive performance [18, 20, 31]. However, the main mechanism of influence of the KD on the human body is its impact on metabolic reorganization [11, 16, 32–35]. Due to the lack of optimal CHO availability, free fatty acid (from the diet or adipose tissue) oxidation and ketogenic amino acid degradation result in the formation of ketone bodies (KB; β-hydroxybutyrate, acetoacetate, and acetone) in the mitochondrial matrix of liver cells [11, 16]. After transporting the KB to extrahepatic cells, they can be used as an energy substrate (acetyl-CoA) in the production of ATP through the oxidative phosphorylation pathway in the citric acid cycle (TCA) . In addition, the metabolic effects of KB are also associated with the sparing and/or attenuation of fuel (glycogen, glucose) selection and lactate production during exercise, anti-lipolytic effects, and increased reliance on intramuscular triglycerides [11, 17]. Further studies are needed to demonstrate the impact of the KD on the synthesis/proteolysis of muscle proteins, although it now seems that anabolic pathways may be downregulated in individuals following a KD diet [36–38]. It can therefore be concluded that diets high in fat upregulate the release, transport, uptake, and utilization of fat in the muscle, even in endurance athletes whose training would have been expected to maximize such adaptations [39–41]. The effectiveness of KD in supporting weight reduction has made it quite popular among athletes competing in sport disciplines with weight categories or aesthetic aspects [42, 43]. New lines of research concerning the utility of KD in sports have focused on performance in endurance trained athletes, most of which concurrently addressed the issue of energy metabolism during exercise and revealed increased fat oxidation under KD [3, 41, 44–46]. However, few studies have investigated the relations between exercise intensity (as measured by maximal oxygen uptake) and fat utilization in detail and these have been underpowered due to low sample sizes . Moreover, no between-gender comparisons in possible energy metabolism differences related to the KD have been made. 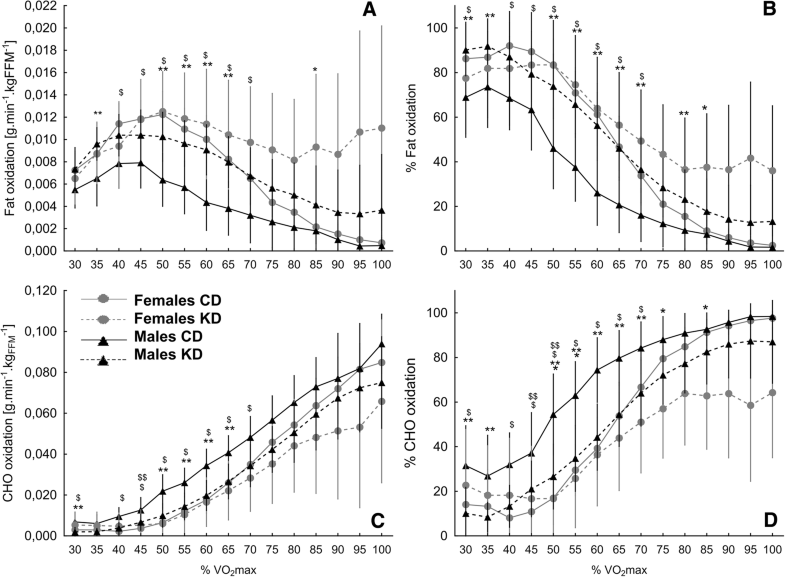 However, it is known that there are gender differences in whole-body fat oxidation kinetics during exercise. 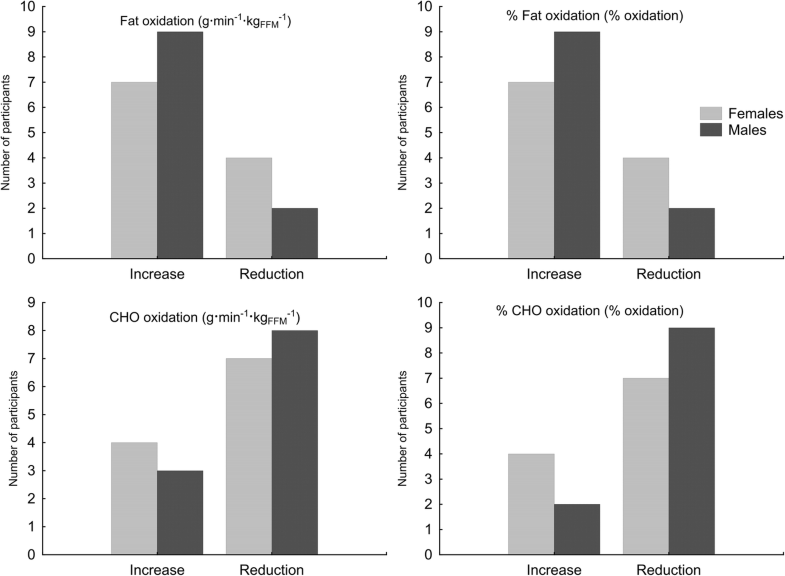 Fat oxidation rates and maximal fat oxidation at submaximal intensities are greater in women than in men, and maximal fat oxidation occur at substantially higher exercise intensities in women than in men . 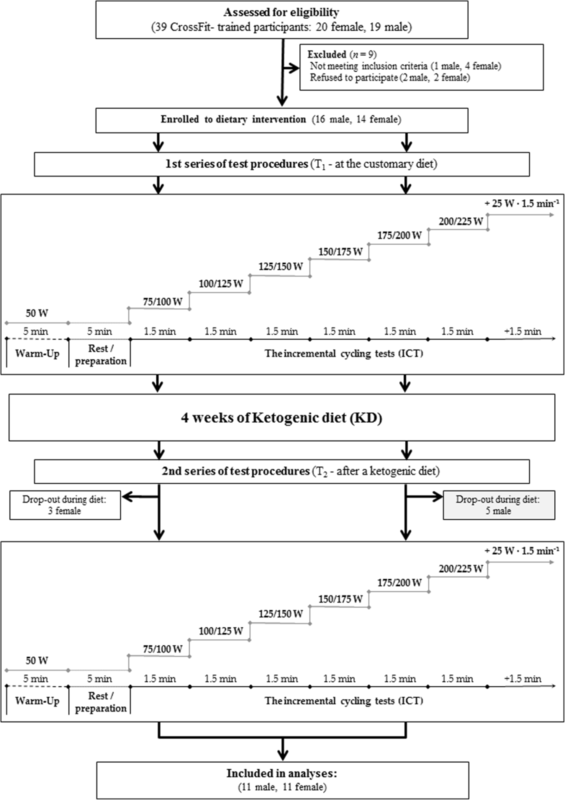 The protocol included two study visits to the laboratory: before (T1, at the CD) and after (T2) the KD diet (Fig. 1). At each visit, body mass and composition were measured, followed by performance of the exercise tests. Three hours before the T1 and T2 visits, the participants consumed a standardized meal corresponding to their habitual food intake or to menu of the KD diet, respectively. The three-hour period between the meal and exercise was chosen to prevent potential short-term effects of a meal on exercise performance [48–50]. On the day following T1 visit, the participants began their prescribed four-week KD diet ending with the T2 visit. The KD model was individualized to ensure weight maintenance throughout the dietary interventions and diets were energetically normalized (covered the estimated EE). They assumed coverage of the recommended daily energy requirement of up to 5% of energy from CHO [3, 9–11]. PRO were administered in the amount of 1.7 g per kilogram of body mass. The remaining energy needs were provided by fats (fats provided more than 75% of the daily energy requirement). An appropriate supply of essential fatty acids in the diet was ensured. Each of the subjects in study group received 10-day menus. Diets were developed considering the type of foods, cooking methods, and pre-established macronutrient ratios. For all diets, in accordance with recommendations, at least 30 ml·kg− 1 of fluids were consumed during the day, and an additional personalized supply for before, during, and after training. Based on other studies that have evaluated nutritional interventions with KD on energy metabolism during exercise, a sample size of eight to eleven per group was deemed to be common [41–45, 59]. Therefore, an initial sample size of 11 per group (females and males) was selected. Furthermore, to confirm that this would be sufficient to detect an intervention effect, a statistical power analysis was performed (G*Power, version 3.1.9.2, Universität Düsseldorf, Germany). The power analysis was performed based on the following inputs: t-test differences between two dependent means (matched pairs) or ANOVA repeated measures between-factors; an alpha value of 0.05, a desired power of 0.80; and a sample size of 11 subjects in each group. The results indicated that a standardized effect size of 0.63 or 0.54 would be detectable (large effect). Furthermore, based on our pilot study and previous studies on different dietary regimes on energy metabolism , we assumed that a sample size of 11 in each group (females and males) would be sufficient to detect significant differences in fat oxidation. The authors of this paper are of the opinion that the legitimacy of using the KD is particularly interesting in the increasingly popular disciplines of functional training, such as CrossFit. In this group of athletes, the KD is characterized by a large and constantly growing popularity; however, there is not enough research on its actual impact. Attention is drawn to the fact that in this type of effort, exercises of varying intensities are combined (resistance, speed-strength, and endurance) . The question then arises as to whether the limited availability of CHO and the use of a KD will effectively influence changes in metabolic adaptation in CrossFit training on the basis of variable exercise stimuli. Attention is also drawn to the fact that the nature of the effort may be related to the effective use of the KD. In addition to the known impacts of classical strength training on the activity of the mTORC1/p70S6k/4E-1BP pathway leading, among other factors, to the stimulation of protein synthesis and ribosomal biogenesis as well as increases in muscle mass and strength, high intensity interval training (often used as part of the Crossfit training) also stimulates the activity of AMPK, SIRT 1, and p38 MAPK signaling and the expression of PGC-1α in skeletal muscle . The latter leads, among other effects, to increases in mitochondrial biogenesis and the fatty acid oxidation capacity [61–65]. These aspects seem to explain, in part, the metabolic adaptations induced by this kind of exercise. Furthermore, short-term high-intensity interval training and/or sprint interval training (SIT), as opposed to traditional endurance training, can, in many cases, lead to similar adaptations in human skeletal muscle and exercise performance (but without a suppressive influence on factors such as muscle protein synthesis and strength), which will be even more the case when combining these types of training, as is often observed in CrossFit . Among the factors affecting the rate of fat oxidation during exercise there are training status, gender, acute and chronic dietary intakes, fat mass content, and exercise intensity [66–68]. In general, fat oxidation is the predominant fuel source (%) during exercise at submaximal intensities (< 65% VO2max). Increases in exercises intensity that exceed 65% of VO2max induce a shift in energy contribution that favors CHO oxidation . In our study, at the pre-intervention testing stage when participants consumed their CD (with percentage energy from CHO 44.2–45.4%, from fat 36.4–36.9%, and from PRO 17.7–19.4%), we confirmed the abovementioned relations regarding exercise intensity (%VO2max) and fat and CHO oxidation rates. These were noted in both females and males. Furthermore, in non-athlete, healthy adults consuming a traditional mixed diet (with energy contributions of 45.4%, 34,3, and 17.3% from CHO, fat, and PRO, respectively), it was previously noted that fat and CHO intakes make modest, but importantly, independent contributions to one’s capacity to oxidize fat during exercise . In recent years, Cox et al. has performed a series of experiments in exercising high-performance athletes after generating acute ketosis through the administration of a ketone ester-based drink. The experiments revealed that ketosis may alter substrate competition for respiration and improve oxidative energy transduction under conditions such as endurance exercise. In this manner, nutritional ketosis may help to unlock greater human metabolic potential which can be suppressed by a high CHO diet . Still, the aforementioned effect needs to be interpreted carefully, while it was achieved after generating acute ketosis by synergistic ingestion of ketone esters and CHO. These conditions cannot be recreated in long-term consumption of KD. It should be also taken into account that in practice the “metabolic” potential may not affect the “performance” potential, which seem to confirm the works in which no effect  or even a performance impairment after ketones ester treatment were observed [72, 73]. However, the utility of the KD in athletes has been studied extensively in the last decade [3, 38, 41–46, 59, 74, 75]. Still, there is great diversity in study designs and methodologies, including the use of various sport disciplines (artistic gymnastics , taekwondo athletes , off-road cyclists , endurance trained cyclists and runners [3, 45, 46, 59], race walkers , CrossFitters , overload training ) and lengths of dietary intervention (4 days , 3 weeks [41, 43, 45], 4 weeks [42, 44], 8 weeks , 10 weeks , 12 weeks , the use of the KD on a habitual basis ), as well as differences in the analyzed outcomes. For this reason, it is difficult to make direct comparisons between our results and results obtained by other authors. Most of the studies included only male subjects [3, 38, 41, 42, 44–46, 59], with only a few studies including both male and female participants [38, 43, 46]. It needs to be emphasized that none of the previous studies focused solely on female athletes or compared the effect of the KD between males and females. For this reason, the between-gender comparison conducted in our study seems to be an original approach and a valuable scientific and practical contribution. Furthermore, CrossFit is still gaining popularity , but to our knowledge, there is only one published study on the use of a KD in CrossFit . In the latter study, it was observed that a 12-week KD, in comparison to a control diet, caused marked reductions in whole-body adiposity while not affecting performance indices in recreationally-trained CrossFit trainees. Still, the results of this study need to be interpreted carefully due to its relatively low sample size (7 participants in the KD group and 5 participants in the control group) and lack of randomization of participants into KD or control group (participants were free to choose which diet to follow). Burke LM. Re-examining high-fat diets for sports performance: did we call the ‘nail in the coffin’ too soon? Sports Med 2015;45 Suppl 1:S33–S49. doi:https://doi.org/10.1007/s40279-015-0393-9.